Last night was one of my favorite kind of nights at The Practice. 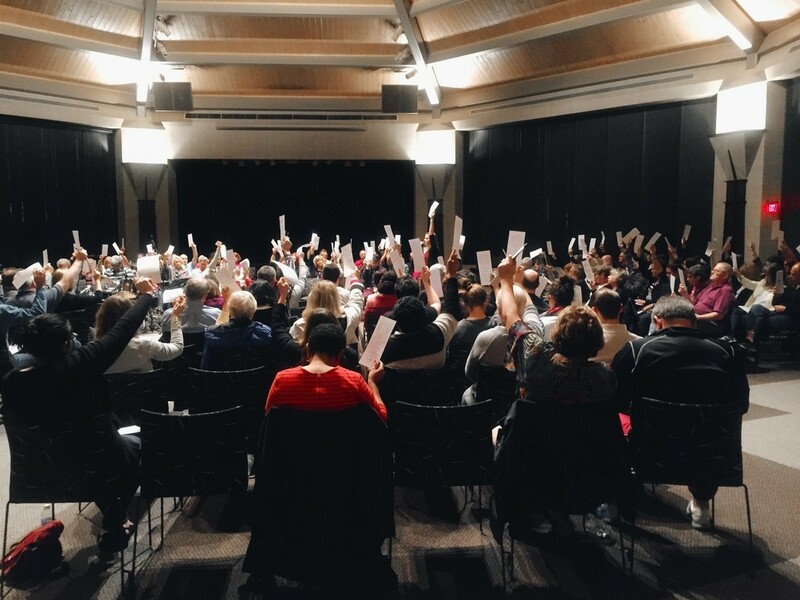 Over the past four weeks we’ve had the privilege to hear Stories of Resurrection from some incredible guests, testifying to the power of Christ’s Resurrection in Race, Religion and Iraq, but last night we got to bring the conversation closer to home, sharing stories of resurrection with one another within our very own community from our community. I was talking with some friends after The Practice last night and we all agreed on one thing, these nights of sharing and listening with one another are always a little anxiety inducing – and sometimes it feels like it would be easier to sit them out, but every single time I participate in them, I have a deep and profound time of connection with real people in our community who are the hands and feet of Christ to me. I’m always so grateful to have been a part of it and at the end of each of these nights I always find myself saying – that was my favorite. We began our night with a shorter opening liturgy, reading scripture together, a time of confession and assurance and a passing of the peace. Before our time of practice began, the wonderful Kellye Fabian got up to share with us all her heart and vision for this listening night. In what ways have you seen resurrection take place in your life and in the world? In what ways are you longing to see more resurrection take place in your life and in the world? In what ways could God be inviting you to join in his work of resurrection in your life and in the world? Then each group had 2 minutes in which the two listeners were able to either affirm the person who had shared or ask a question that had come to mind for them as they were listening. After this process was complete, we repeated it for each person until everyone had had a chance to listen and share. Once we were all finished we turned our chairs back to the center of the room and Kellye invited us all to share how the experience went for us, here is just some of the feedback we heard. After this time of debriefing, we came back to the center of it all, the table, for Eucharist. John led us in our time of communion and after taking the bread and the cup we ended our time of worship with the doxology, praising God for all he has done for us. 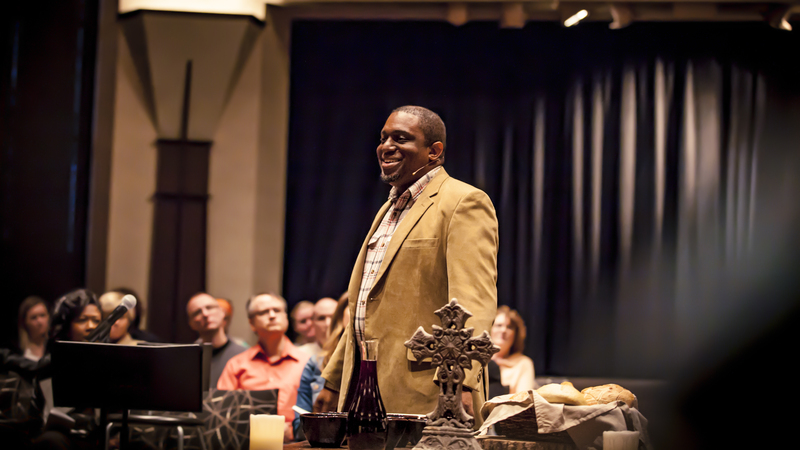 Our next series Living the Liturgy will begin on May 15, 2016 – and we cannot wait to dive into the historic liturgical practices of the church and how they spill into the rest of your week with you all! An update is coming soon, but in the meantime – check out the dates on our calendar to stay in the loop! Curtis Miller has been working hard to provide an opportunity for more parents to attend The Practice by exploring ways to care for children during the gathering. During our Living the Liturgy series, we are excited to share that we will be experimenting with “Practice Kids” for kids up to 5th grade. More information coming soon! Thank you all, as always, for being on the journey with us, it is a gift to share with you and to hear your stories of resurrection. 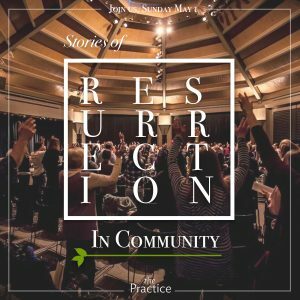 Springtime arrived in Chicagoland this past weekend, and even a little bit of summertime was peeking its head around the corner as we gathered this past Sunday night to hear Sarah Bessey speak on Resurrection in Religion. It was as if the deadness of winter was being shed for the new life of warm days and bright sun. A sense of expectancy and hope seemed to be in the air as we began our liturgy last night. 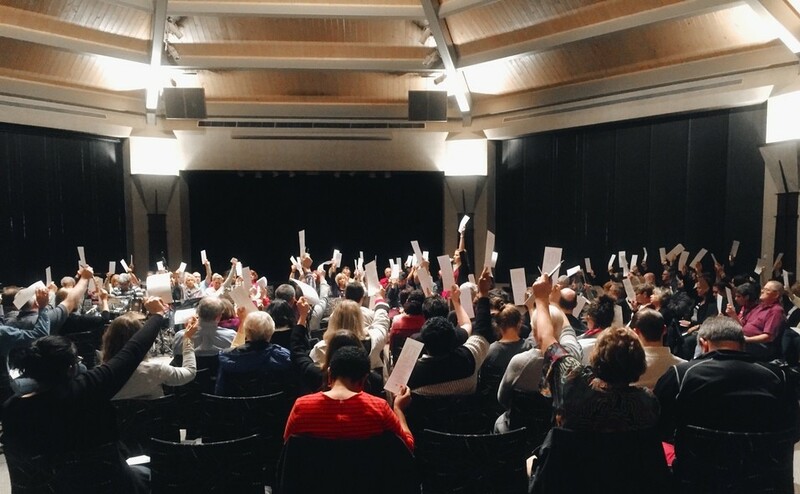 After starting with a magnificent reading from the lectionary reading from Revelation, there seemed a recognition in the room that worship was taking place. Different refrains each echoed the same thought: for all our wrestling with grief this past season of lent, in view of Eastertide there is much to praise. The liturgy continued into a confession and assurance–an invitation to reflect on the words of Psalm 23, “The Lord is my shepherd, I lack nothing.” After Jenna read the passage, she asked, “What word or phrase is standing out to you this evening?” For me, the words that stood out were fear and comfort. “I will fear no evil, for you are with me, your rod and your staff they comfort me.” Those darkest valleys have been looming large, and I was in need of those gentle words. Before passing the peace with one other, we were invited in to the difficult practice of praying for our enemies. There was something so moving about being assured the provision and presence of God in Psalm 23, only to be called to respond by praying for those we’d prefer to scorn, blessing those who we’d rather curse. I’m embarrassed to admit faces easily came to mind for me, people both near and far, though as we prayed for those people, I felt their burden lift. Life is more lightly lived when we’re praying for our enemies. All of this, of course, was rich preparation for a time of teaching and practice on stories of resurrection in religion. There truly could not be a more helpful voice to guide us into that exploration than Sarah Bessey’s. She wove together a complex tale of youthful faith, persistent doubts, tragic grief, and resurrected hope. You can listen to her message through The Practice Podcast or here below. What stood out to me most about Sarah’s story was her peace in the midst of continuing questions. She modeled to us what it looks like to hold together all the beauty and brokenness. She told us about kind voices in the midst of lonely churches, and moments of celebration, watching her children dance in a charismatic church even as she needs the rhythms of contemplative liturgies. Eyes to see gratitude for the resurrection around us. Eyes to see longing where resurrection has not yet occurred. Eyes to see the spaces and places in our lives where we are being invited to join with God’s resurrection. Friends, as I conclude this reflection, I’m struck by Sarah’s story of unknown woman who approached her during her season of great sadness and said to her these beautiful words: “God has not forgotten you.” I wonder if some of us, as we reflect on our stories with religion, need to hear those words today. Yet even more, I wonder if there are some of us who need to offer that word to someone we know. For resurrection to take place in religion, it requires faithful, Christ-loving women and men to join with God’s resurrection by offering new life to dead places. Is there someone you know who needs to hear a word of comfort from God this week in their own story of religion? May we together be a community of believers with eyes to see the good news of resurrection taking place all around us, even as we extend that resurrection to others. 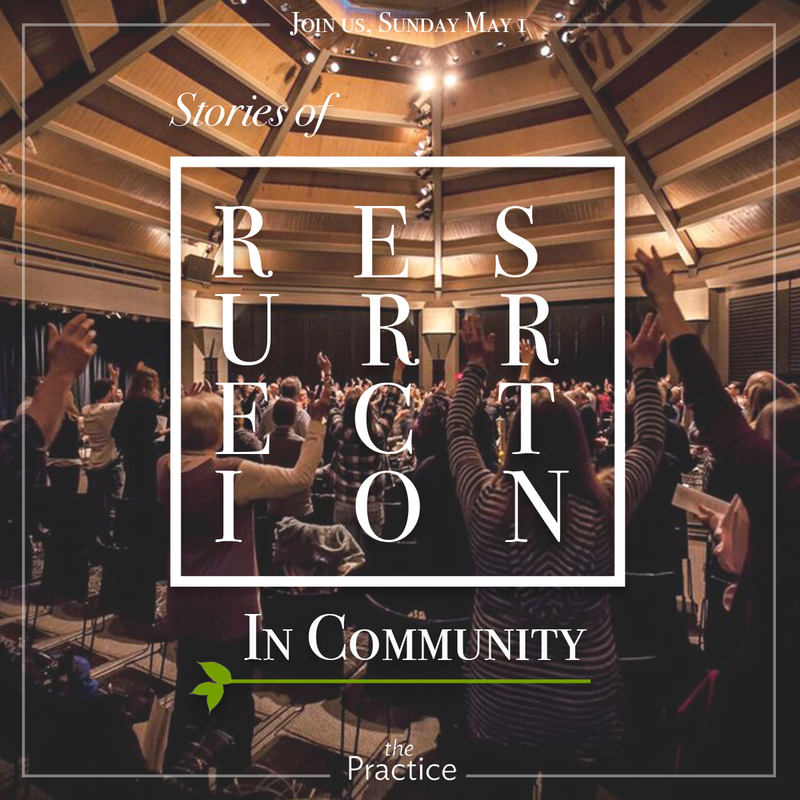 In view of Easter, this Sunday begins a five week journey called Stories of Resurrection: Cultivating Eyes to See & Join God’s Redemption Everywhere. During Lent, we were encouraged to go deep and dark into lament, and now we are invited to go up and out in celebration of Resurrection. Please join us. Friends, resurrection didn’t just happen one time in Palestine, 2000 years ago. Through the risen Christ, resurrection keeps happening–in our relationships, neighborhoods, hearts, churches, families, vocations, and any other realm of life that God cares about–which is ALL of life! Death didn’t have the last word over Jesus Christ, and it will not have the last word over the world that God so loves. We are invited to partner with God in the great redemption and restoration of all things. (1) Gratitude. Eyes to see where resurrection is happening in my life and world. (2) Longing. Eyes to see where resurrection is needed in my life and world. (3) Joining. Eyes to see how to join God’s work of resurrection in my life and world. 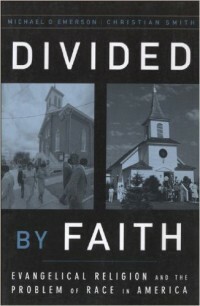 Aaron Niequist will share the big invitation and framework for the journey. 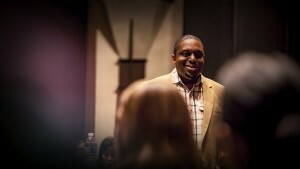 David Bailey will talk honestly about race in America, and share his story of being a reconciler in the name of Christ. Sarah Bessey will share about growing up in Christianity, needing some part of her faith to die, and then experiencing resurrection in her own relationship with God and the church. Jeremy Courtney will tell his story about living with his wife and two kids in troubled Iraq, and how they see both horror and resurrection happening all around them. And then we’ll have a chance to share our own stories of resurrection with each other. But those are just the speakers. Each gathering will begin with a robust opening liturgy, offer space to pray for the world, teach new ways to practice resurrection, and guide us to the Table to receive Holy Communion. Beyond hearing new ideas, we are passionately pursuing ways to put Christ’s words into practice for the sake of the world. You–and anyone you know–are welcome to join us. 6pm in the Willow Creek Chapel.